Aurorae are rare. 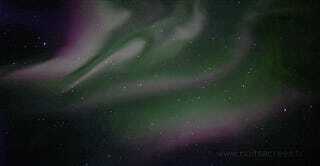 Pulsating aurorae, whose structures fade in and out of existence, are rarer, still. But rapidly pulsating aurorae, like that featured in this video by French astrophotographer Stéphane Vetter (previously), are among the least common of all. This footage is not a time-lapse; the colors in this video are flickering in real-time. The 48-second video shown is not time-lapse. The real-time pulsations are exemplified by sequences where the astrophotographer is visible moving about in the foreground. A close inspection of the enigmatic flickering sky colors reveals that some structures appear to repeat, while others do not. The quick rapidity of the pulsations seen here is somewhat unusual — more common are aurora with pulsations that last several seconds. Recent research shows that pulsations are more common in electron-generated aurora, rather than proton aurora, and that the Earth’s local magnetic field may fluctuate in unison.